Apple Inc. said Tuesday that almost one of every six iPhones sold may have been unlocked to run on unauthorized wireless networks, surprising analysts who had estimated the problem wasn't as widespread. Chief Operating Officer Timothy Cook said 250,000 of the nearly 1.4 million iPhones sold might have been bought by users with the intention of unlocking them to work on a network other than AT&T's. "I did not think it was that much," said Gene Munster, an analyst at Piper Jaffray & Co. in Minneapolis, describing the 250,000 figure as "huge." Some people have been buying five phones at a time at Apple stores in the U.S., modifying the software that locks it to AT&T's service, and then reselling the unlocked iPhones overseas. To quash unauthorized use, Apple released an iPhone software update last month that rendered some unlocked devices inoperable -- an approach that users described as turning the gadget into a "brick." Hacker groups have since developed software that bypasses Apple's update and allows bricked phones to work again, according to appleinsider.com. Apple said Monday it sold 1.12 million phones in the three months ended Sept. 29. -Atlanta Braves baseball team—100%; Atlanta Braves: in 2/2007 purchased from Time Warner in a complex deal, in which $1 billion cash, a group of craft magazines & the Braves (valued at approximately $450 million) were exchanged for 60 million Time Warner stock shares. -Hallmark Entertainment Investments Co.—11% Owner of controlling interest in Crown Media Holdings, Inc., the owner and operator of U.S. cable television channels, including the Hallmark Channel. Liberty Media has an approximate indirect 9% economic ownership in Crown Media Holdings, Inc. (NASDAQ: CRWN) through its investment in Hallmark Entertainment Investments Co.
-50% stake in Discovery - television networks such as the Discovery Channel, the Travel Channel, the Learning Channel and Animal Planet - and the Ascent media postproduction business. -GoPets Ltd. -28%- Virtual community of pets that interact with each other and other users all over the world. -Expedia inc, owners of : Expedia.com, Hotels.com, Hotwire, Expedia Corporate Travel, TripAdvisor and Classic Vacations.—23%; Liberty Media owns approximately 23% of Expedia common stock representing an approximate 52% voting interest; however, the Chairman and CEO of Expedia currently has the authority to vote these shares. -IAC/Interactive Corp. , Comprised of HSN cable channel; Cornerstone Brands, Inc.; HSE24; Shoebuy.com; Ticketmaster; Lending Tree; RealEstate.com; ServiceMagic; Match.com; Entertainment Publications; Interval International; Ask.com; Citysearch; Evite; Gifts.com; iBuy; Pronto; and CollegeHumor. –24%; Liberty Media owns approximately 24% of IAC common stock representing an approximate 55% voting interest; however, the Chairman and CEO of IAC currently has the authority to vote these shares. DirecTV—owned News Corp—16%; On December 22, 2006 Liberty Media announced that it entered into a definitive agreement with News Corporation to exchange Liberty Media's stake in News Corporation for a News Corporation subsidiary holding a 38.5% stake in DIRECTV Group, Inc., regional sports networks in Denver, Pittsburgh, and Seattle, and $550 million in cash, (with an aggregate value of US$11 billion).. That transaction will allow both sides to avoid paying taxes. News Corporation will retire Liberty's 19% voting stake in a major share buyback that will increase the Murdoch family's stake to around 36%. It originated as part of TCI, an American cable television group, and acquired by AT&T in 1999 for $54 billion. -2001- It was spun-off from AT&T, subsequently spending $5 billion on nine German regional cable networks. -In the second half of 2001 it aggressively acquired cable operators and content developers in the EU. During 2003 it bought the remaining 57% of QVC from Comcast for US$7.9 billion and absorbed Liberty Livewire Corporation (formed as a result of the 2000 and 2001 acquisitions of The Todd-AO Corporation, Four Media Company, Video Services Corporation, certain operations of SounDelux Entertainment Group and other businesses engaged in the provision of creative and technical services for the media and entertainment industries). -In 2004 it increased its voting stake in News to 9% (and its economic interest to 17%, later to 19%), becoming the largest shareholder in the Murdoch-controlled group. -In March 2005 Liberty announced plans to spin off its stake in the Discovery cable and satellite business, with new publicly traded company (to be called Discovery Holdings and worth between US$10 and $15 billion) housing Liberty's 50% stake in Discovery - television networks such as the Discovery Channel, the Travel Channel, the Learning Channel and Animal Planet - and the Ascent media postproduction business. Income disparity reaches highest since 1920s, paper reports, with recent Wall Street boom partly to blame. NEW YORK (CNNMoney.com) -- The income gap between the wealthiest and poorest Americans grew to its widest level since the 1920s, according to a report published Friday. 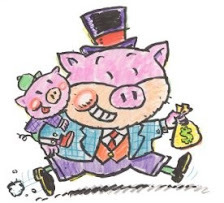 Citing Internal Revenue Service data, the Wall Street Journal reported that the wealthiest 1 percent of all Americans earned 21.2 percent of all the nation's income in 2005, up from the previous high of 20.8 percent in 2000. Conversely, the bottom half of working Americans earned just 12.8 percent of all the nation's income, down from 13.4 percent in 2004 and slightly lower than 13 percent in 2000. While the IRS data only dates back as far as 1986, academic experts told the paper that the last time the rich had this large of a share of income was during the 1920s. The figures, based on "adjusted gross income" which incorporates certain deductions such as contributions to individual retirement accounts, revealed that the income level for the tax filer in wealthiest 1 percent of Americans grew 3 percent to $364,657 between 2000 and 2005, according to the Journal. At the same time, the median American income, however, slipped 2 percent during that same period to $30,881. Academic experts told the paper that the income disparity among Americans was due a combination of factors including globalization and technical advances, which favor the most skilled workers, while the recent boom on Wall Street was also seen playing a large part. Leading up to this summer's market meltdown, stocks were on a tear, while the availability of cheap credit helped led not only to big deals, but hefty payouts for workers in the private equity, hedge fund and investment banking businesses. The heads-up signals that oil firms' profits will be more modest in future quarters. "the merely affluent are diminishing the ability of the very rich to derive pleasure"
Furthermore, they are getting diminishing psychological returns on their spending now that luxury brands are becoming democratized. When there are 379 Louis Vuitton and 227 Gucci stores, who cares? Citigroup's Ajay Kapur applies the term "plutonomy" to, primarily, the United States, although Britain, Canada and Australia also qualify. He notes that America's richest 1percent of households own more than half the nation's stocks and control more wealth ($16 trillion) than the bottom 90percent. When the richest 20 percent account for almost 60 percent of consumption, you see why rising oil prices have had so little effect on consumption. Kapur's theory is that "wealth waves" develop in epochs characterized by, among other things, disruptive technology-driven productivity gains and creative financial innovations that "involve great complexity exploited best by the rich and educated of the time." For the canny, daring and inventive, these are the best of times - and vast rewards to such people might serve the rapid propulsion of society to greater wealth. But it is increasingly expensive to be rich. The Forbes CLEW index (the Cost of Living Extremely Well) - yes, there is such a thing - has been rising much faster than the banal CPI (consumer price index). At the end of 2006, there were 9.5 million millionaires worldwide, which helps to explain the boom in the "bling indexes" - stocks such as Christian Dior and Richemont (Cartier and Chloe, among other brands), which are up 247 percent and 337 percent respectively since 2002, according to Fortune magazine. Citicorp's "plutonomy basket" of stocks (Sotheby's, Bulgari, Hermes, etc.) has generated an annualized return of 17.8percent since 1985. This is the outer symptom of a fascinating psychological phenomenon: Envy increases while - and perhaps even faster than - wealth does. When affluence in the material economy guarantees that a large majority can take for granted things that a few generations ago were luxuries for a small minority (a nice home, nice vacations, a second home, college education, comfortable retirement), the "positional economy" becomes more important. Positional goods and services are inherently minority enjoyments. These are enjoyments - "elite" education, "exclusive" vacations or properties - available only to persons with sufficient wealth to pursue the satisfaction of "positional competition." Time was, certain clothes, luggage, wristwatches, handbags, automobiles, etc. sufficed. But with so much money sloshing around the world, too many people can purchase them. Too many, in the sense that the value of acquiring a "positional good" is linked to the fact that all but a few people cannot acquire it. That used to be guaranteed because supplies of many positional goods were inelastic - made by a small class of European craftsmen. But when they are mass-produced in developing nations, they cannot long remain such goods. When 40 percent of all Japanese - and, Fortune reports, 94.3 percent of Japanese women in their 20s - own a Louis Vuitton item, its positional value vanishes. James Twitchell, University of Florida professor of English and advertising, writing in the Wilson Quarterly, says this "lux populi" is "the Twinkiefication of deluxe." Now that Ralph Lauren is selling house paint, can Polo radial tires be far behind? When a yacht manufacturer advertises a $20 million craft, cachet is a casualty. As Adam Smith wrote in "The Wealth of Nations," for most rich people "the chief enjoyment of riches consists in the parade of riches, which in their eye is never so complete as when they appear to possess those decisive marks of opulence which nobody can possess but themselves." Hennessy understands the logic of trophy assets: It is selling a limited batch of 100 bottles of cognac for $200,000 a bottle. There is some good news lurking amid the vulgarity. Americans' saving habits are better than they seem because the very rich, consuming more than their current earnings, have a negative savings rate. Furthermore, because the merely affluent are diminishing the ability of the very rich to derive pleasure from positional goods, philanthropy might become the final form of positional competition. Perhaps that is why so many colleges and universities (more than 20, according to Twitchell) are currently conducting multibillion-dollar pledge campaigns. When rising consumption of luxuries produces declining enjoyment of vast wealth, giving it away might be the best revenge. What Companies Dominate the Right-Wing Radio Talk Show Business? "Our analysis in the spring of 2007 of the 257 news/talk stations owned by the top five commercial station owners reveals that 91 percent of the total weekday talk radio programming is conservative, and 9 percent is progressive. Each weekday, 2,570 hours and 15 minutes of conservative talk are broadcast on these stations compared to 254 hours of progressive talk—10 times as much conservative talk as progressive talk." Several interesting things were not mentioned in the summary of this report: for CBS radio, of their total of 30 news or talk stations that air or could air 720 hours of programming a day (24 hours times 30), they only aired 68.5 hours of conservative talk. That's only 9.5% of their total airtime. Only 3.3% of their total airtime was devoted to progressive talk, but also a whopping 88% was non-political by the standards in this study. While the progressive percentage should be equal to the conservative time, this huge amount of non-political fare is what a good news broadcaster should be doing. On the other hand, the other big 5 radio owners had super-high percentages of conservative talk compared to their total airtime. Clear Channel was 40% conservative vs. 6.5% progressive; Citadel was 49% conservative vs. .0018% progressive; Cumulus was 38% conservative vs. 0% progressive and Salem was 83% conservative vs. 0% progressive. Another big broadcaster that is not in the top 5, Disney/ABC, has similar high percentages of conservative shows. In fact, nationwide, they are the network that airs Rush Limbaugh and Sean Hannity in most of the U.S.'s big cities. Disney now no longer owns ABC radio, as they sold it to Citadel Broadcasting in June of 2007. What this shows is that CBS, owned by the same guy who owns the Daily Show and the Colbert Report, is not necessarily the right wing cesspool that they have been lumped into. The other broadcasters, however, are clearly abusing the public airwaves with which they have been entrusted. The new report entitled The Structural Imbalance of Political Talk Radio raises serious questions about whether the companies licensed to broadcast over the public radio airwaves are serving the listening needs of all Americans. While progressive talk is making inroads on commercial stations, right-wing talk reigns supreme on America’s airwaves. -In the spring of 2007, of the 257 news/talk stations owned by the top five commercial station owners, 91 percent of the total weekday talk radio programming was conservative, and only 9 percent was progressive. -Each weekday, 2,570 hours and 15 minutes of conservative talk are broadcast on these stations compared to 254 hours of progressive talk; 10 times as much conservative talk as progressive talk. -76 percent of the news/talk programming in the top 10 radio markets is conservative, while 24 percent is progressive. Two common myths are frequently offered to explain the imbalance of talk radio: 1) the 1987 repeal of the Fairness Doctrine (which required broadcasters to devote airtime to contrasting views), and 2) simple consumer demand. Each of these fails to adequately explain the root cause of the problem. The report explains: Our conclusion is that the gap between conservative and progressive talk radio is the result of multiple structural problems in the U.S. regulatory system, particularly the complete breakdown of the public trustee concept of broadcast, the elimination of clear public interest requirements for broadcasting, and the relaxation of ownership rules including the requirement of local participation in management Ultimately, these results suggest that increasing ownership diversity, both in terms of the race/ethnicity and gender of owners, as well as the number of independent local owners, will lead to more diverse programming, more choices for listeners, and more owners who are responsive to their local communities and serve the public interest. Along with other ideas, the report recommends that national radio ownership not be allowed to exceed 5 percent of the total number of AM and FM broadcast stations, and local ownership should not exceed more than 10 percent of the total commercial radio stations in a given market. (excerpts): SAN ANTONIO – April 20, 2007 – Clear Channel Communications, Inc. (NYSE:CCU) announced today it has entered into a definitive agreement to sell its Television Group to Providence Equity Partners Inc. for approximately $1.2 billion. The sale includes 56 television stations (including 18 digital multicast stations) located in 24 markets across the United States. Also included in the sale are the stations’ associated Web sites, the Television Operations Center, and Inergize Digital Media, which manages the Television Group’s online and wireless initiatives. The transaction is expected to close in the fourth quarter of 2007, subject to regulatory approvals and other customary closing conditions. The Television Group currently consists of ten CW, eight FOX, seven NBC, six ABC, six CBS, four My Network TV, two NBC Weather Plus, two Telemundo, five independent stations, and six stations affiliated with Clear Channel’s Variety Television Network (VTV). A chart of the individual broadcast properties, by location and network affiliation, is attached below. Clear Channel estimates net proceeds after-tax and after customary transaction costs will be approximately $1.1 billion for the Television Group. Information on the treatment of tax loss carry forwards relative to this sale is provided below. Clear Channel previously announced that it was also attempting to divest 448 radio stations in 88 markets. To date the Company has entered definitive agreements to sell 161 radio stations in 34 markets for a total consideration of approximately $331 million. The Company expects these transactions to close during the second half of 2007. The Company estimates net proceeds after-tax and after customary transaction costs for these 161 stations will be approximately $300 million. Information on the treatment of tax loss carry forwards relative to these sales is provided below. The Company continues to pursue the divestiture of 287 radio stations in 54 markets. These remaining stations that are not under definitive agreement had OIBDAN* of approximately $54 million in 2006. There can be no assurance that any or all of these stations will ultimately be divested and the Company reserves the right to terminate the sales process at any time. More information is available at www.clearchannel.com. Providence Equity Partners Inc. is the leading global private equity firm specializing in equity investments in media, entertainment, communications and information companies around the world. The principals of Providence Equity manage funds with approximately $21 billion in equity commitments and have invested in more than 100 companies operating in over 20 countries since the firm's inception in 1990. Significant investments include Bresnan Broadband Holdings, Casema, Com Hem, Digiturk, Education Management Corporation, eircom, Freedom Communications, Idea Cellular, Kabel Deutschland, Metro-Goldwyn-Mayer, Ono, Open Solutions, PanAmSat, ProSiebenSat.1, Recoletos, TDC, Univision, VoiceStream Wireless, Warner Music Group, Western Wireless and Yankees Entertainment Sports Network. Providence Equity is headquartered in Providence, RI (USA) and has offices in New York and London. The firm is opening offices in Hong Kong and New Delhi. CBS Networks: CBS Television Network, UPN, Showtime Networks, Inc. (SNI) owns Showtime, The Movie Channel, Flix, Showtime Too, Showtime Showcase, Showtime Extreme, Showtime Beyond, Showtime Next, Showtime Women, Showtime Familyzone, TMC XTRA, Showtime HD, The Movie Channel HD, Showtime on Demand, Sundance Channel (joint venture, SNI owns 30%), Showtime PPV, CBS Entertainment, CBS News, CBS Sports, CSTV Networks, Inc.
CBS Programming: The Early Show, 60 Minutes, 48 Hours, Face the Nation, CW Network (50% with Time Warner), CBS Paramount TV, Spelling Television, King World. VIACOM Networks: MTV Music Television, MTV2, Nickelodeon, Nick at Nite, TV Land, VH1, Spike TV, CMT: Country Music Television, Comedy Central, MTV U, LOGO (planned for 2005), MTV World (planned for 2005), MTV Films, Nickelodeon Movies, Paramount Comedy, The Box, Game One, Viva, TMF (The Music Factory), MTV Network Europe, MTV base, BET, BET Jazz, BET Gospel, BET Hip Hop. Viacom has teamed with Microsoft to operate an MTV site offering video and MP3 downloads. The company has also launched broadband versions of its cable networks, including MTV, Comedy Central and Nickelodeon. CBS still owns the CBS Television City attraction at the MGM Grand Hotel & Casino (Las Vegas, NV). Magazine, Gruner+Jahr: owns more than 285 print titles, including: Child, Family Circle, Fast Company, Fitness, Inc., Parents, Parents Expecting and Baby, National Geographic, Brigitte, Stern, and Geo. Random House owns more than 100 imprints including: Ballantine Publishing Group, Bantam Bell Publishing Group, Broadway, Crown Publishing Group, Doubleday Broadway Publishing Group, Pantheon, Random House UK, Transworld, Sudamericana, C. Bertelsmann, Karl Blessing Verlag, Goldmann, Siedler Verlag, Wolf Jobst Siedler Verlag, Plaza & Janes (50%), Grijalbo Mondadori (50%), Knopf Publishing Group, RH Adult Trade Publishing Group, RH Audio, RH Children�s Books, RH Direct, Inc., RH Information Group, RH International, RH Large Print, RH Value Publishing, and Waterbrook Press. All subsidiaries own publishing groups of their own. Music: BMG, consisting of joint venture Sony BMG Music Entertainment (50%) and BMG Music Publishing. BMG Sony owns record labels Arista Records, Columbia Records, Epic Records, J Records, Jive Records, LaFace Records, Legacy Recordings, Provident Music Group, RCA Records, RCA Victor Group, RLG-Nashville, SONY BMG Masterworks, Sony Music Nashville, Sony Urban Music, Sony Wonder, So So Def Records, Verity Records. BMG Music Publishing owns copyrights to more than 1 million songs. 37 U.S. Stations in 28 markets as of May, 2006. For an official list, please see their corporate website. Currently, a total of 35 stations, consisting of 25 Fox stations and 10 MyNetworkTV stations. 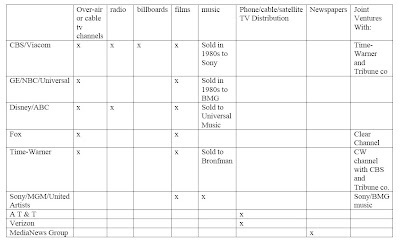 Note: **Indicates original Fox-owned stations from the network's inception in 1986. Asia: STAR (satellite television in Asia), Space TV (India DBS 20%), Phoenix Satellite Television (38%), Hathway Cable and Datacom (26%), China Network Systems (17 affiliated cable systems), BskyB, DIRECTTV, SKY Italia, FOXTEL (25%, Australia’s leading subscription television provider). Australia/Asia: More than 110 titles including: Daily Telegraph, Fiji Times, Nai Lalakai, Shanti Dut, Gold Coast Bulletin, Herald Sun, Newsphotos, Newspix, Newstext, NT News, Post-Courier (63%), Sunday Herald Sun, Sunday Mail, Sunday Tasmanian, Sunday Times, Sunday Territorian, The Advertiser, The Australian, The Courier-Mail, The Mercury, The Sunday Mail, The Sunday Telegraph, Weekly Times, The Weekend Australian, MX, Brisbane News, Northern Terrirory News, Cumberland (NSW), Leader (VIC), Quest (QLD), Messenger (SA), Community (WA), Darwin Sun/Palmerson Sun (NT). Fox is also now offering a mobile entertainment package called Mobizzo on Cingular and T-Mobile phones. Sports: National Rugby League, Stats, Inc..
Australia and New Zealand: News Interactive, Sky Network Television Limited (44%). International media companies: News Limited (Australia), News Optimus Ltd. (in UK).